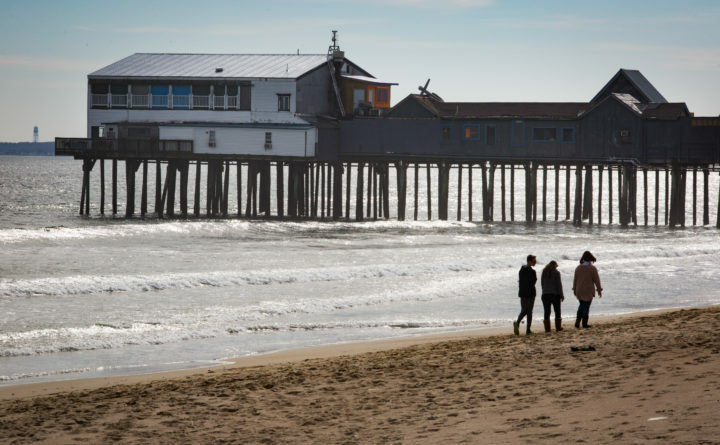 Three teenagers stroll past the pier at Old Orchard Beach on Wednesday during record-breaking warmth. OLD ORCHARD BEACH, Maine — The town has directed the town manager to purchase a seasonal bathroom for the corner of Union and West Grand avenues. The town owns seasonal public bathrooms in the downtown area which have been in operation for many years. The move to place a public bathroom outside the downtown area comes after complaints last summer from residents who said they witnessed people relieving themselves on the beach and on nearby private property. The Town Council Tuesday night voted to allow the town to pay up to $72,000 to purchase a seasonal bathroom trailer. Town Manager Larry Mead said he had identified four potential vendors for the new facility, and prices ranged from about $44,000 to about $72,000. Mead said shipping for the item could take up to 10 weeks, and he wanted to allow the town time to set it up for the summer season. “I want to be able to really nail down which option offers the best value and the best quality for what we will need here in Old Orchard Beach,” said Mead. Mead said the town is looking to purchase a three-stall, seasonal restroom trailer that would be hooked up to town sewer and water. One of the the three stalls would be handicapped accessible. The proposed bathroom would be open during daylight hours in the summer, catering to beach goers. There would be no attendant at the bathroom. Mead said the bathroom needed to be “strong and functional,” to be able to withstand public use and be transported off site in the winter and stored off season. The proposed bathroom would be a short walk from the beach on land next to the train tracks on Union Avenue that the town would be able to use through an agreement with the property owner. Mead said that while other communities may have restrooms adjacent to the beach, this was not an option for Old Orchard Beach as the town did not own any property next to the beach. He said the proposed location of the Union Avenue bathroom is about the same distance from the beach as the bathrooms at the town’s parking lot on Milliken Street. “Is it perfect and ideal, no, but it is functional,” said Mead. Mead said if the proposed bathroom works out, the town could consider installing another one somewhere else in the future. “It’s not something we could put up and down the beach because it’s too much money, but it may be that we end up putting another unit or two in different locations,” he said. Town Councilors Shawn O’Neill and Michael Tousignant both voted in opposition. “Well, I guess I have to say shame on us. This issue made a mockery of our town last summer, and we as council failed to discuss it when it was hot in the press,” said O’Neill. O’Neill said he thought the need to address the issue was urgent, it needed to be discussed more thoroughly at workshop session before the Town Council made any decisions. “I am by no means trying to delay it, but to have just one location for our entire beach in addition to what we already have in existence, does not cut it for me,” he said. Tousignant said he had received calls on the issue from residents in neighborhoods across town, and he too, thought matter needed to be discussed in a workshop. “Believe me the whole beach is putting up with this. It’s not just Union Avenue,” he said. Town Councilor Jay Kelley said Union Avenue was a busy area, and it was a good area for the town to begin to address the needs for more bathrooms. “We can’t possibly cover all the side streets to the beach, there’s no way we can do that, but we have to start somewhere,” said Kelley.